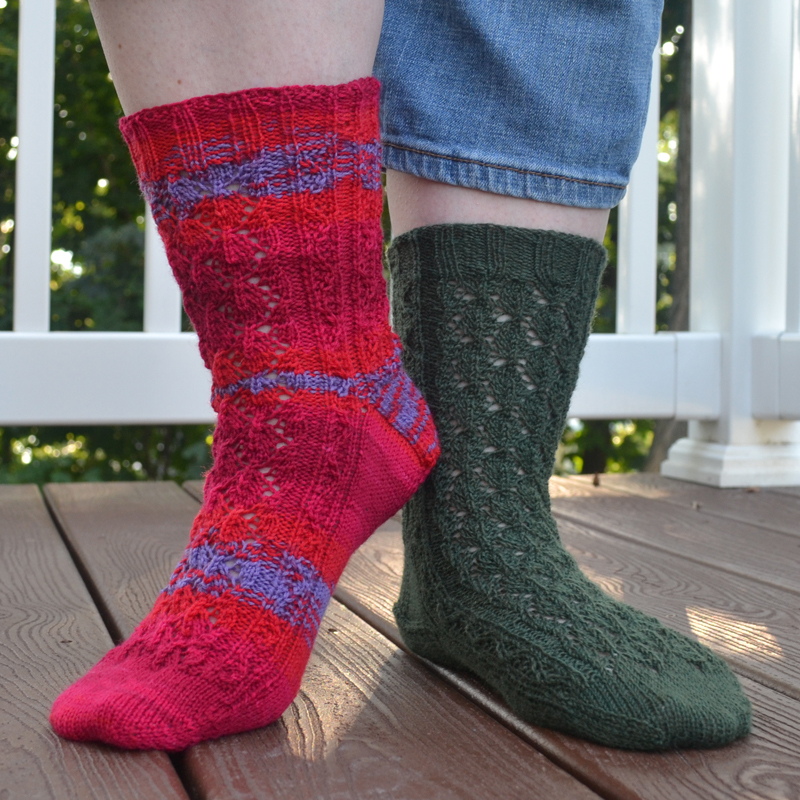 Just uploaded to Ravelry today, Leaves and Climbing Vines Socks. Leaves & Climbing Vines Socks: Toe-up on left, Cuff-down on right. The red one was knit toe up; the green one was knit cuff down. I’ve finally started on the second green sock! Pattern includes both toe-up and cuff-down instructions. The toe-up version has gusset increases on the bottom of the foot and a slip-stitch heel. The cuff-down version has a slip-stitch heel worked in the round with gusset increases worked at the same time, no picking up stitches down the side of a heel flap. Quickie project: a much-needed summer headband! I thought of making a stretchy lace headband out of Cascade Fixation a while ago… and after gutting our upstairs bathroom for renovation this weekend — with hair hanging in my eyes and sticking to my schvetty face (hair not quite long enough to stay in a ponytail) — I finally sat down to make one on Memorial Day. I already knew I wanted to use Wendy Knits’ Summer 2008 Sock pattern for the lace. I made the socks last year, and knew the stitch pattern was naturally stretchy. Combine that with a stretchy, cotton/elastic yarn like Cascade Fixation, and you have the makings of a very stretch piece of knitting perfect for a headband. This was the first attempt. click to embiggen. 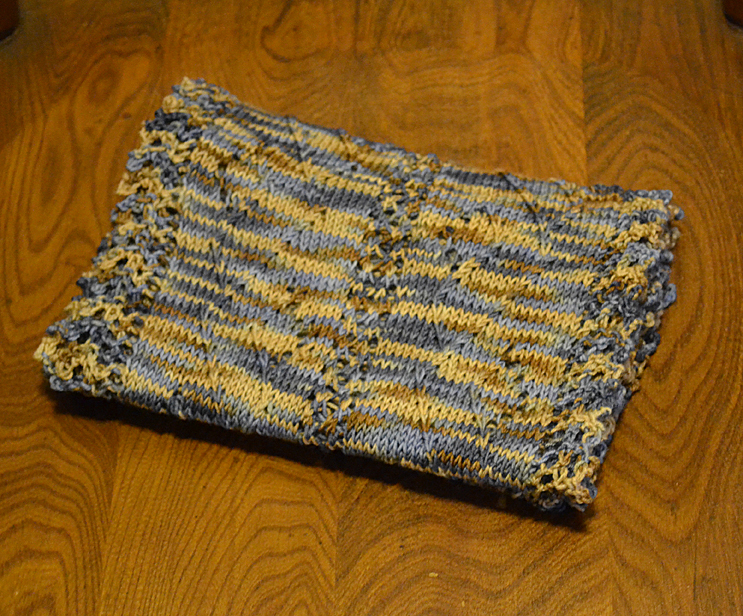 So I did some more math and cast on with 12 fewer stitches, and also knitted one less repeat of the 3-row pattern. BINGO! That did the trick. Just a few hours later, I had Take Two finished and it fits perfectly. Second attempt – much better! Size: Approx. 14.5″ circumference unstretched, 21″ fully stretched out. Yarn: Cascade Fixation, approx. 20 yards. Needles: US size 4 (3.5mm), used magic loop technique on one long circular needle. Started & finished 5/26/09 (just a few hours of knitting). Cast on 76 stitches loosely, and/or using a stretchy cast-on (I used long-tail cast-on). Join in a circle, being careful not to twist. Work two rounds of K1 P1 ribbing. Work 3-row Summer 2008 Sock lace pattern 3 times, then work rounds 1 and 2 of lace pattern (11 rounds total of lace pattern). Work two rounds of K1 P1 ribbing. Bind off using your favorite stretchy method (I used Elizabeth Zimmermann’s sewn bind-off). Weave in ends and you’re all set! Please note: Stitch count given in instructions is based on using Cascade Fixation, which is a VERY stretchy (unbelievably stretchy), DK-weight cotton/elastic yarn. If you are using a different yarn that is finer or thicker, and/or not as stretchy, you may need to adjust your stitch count. Measure around your head snugly with a tape measure, around the part where you will wear the headband. Work up a swatch in the round following the instructions above, but with a 32-stitch cast-on. When finished, flatten the swatch on a firm surface, and measure the length while stretching the swatch as much as you can (really, really stretch it). Multiply that measurement by two (to get the circumference). Do some math: 32 divided by whatever number you got for your circumference. That will be the stitches per inch when stretched. Multiply that number by the snug measurement around your head in inches. That’s the approximate number you need for your cast-on. For your cast-on, you need an even number, preferably one that when divided by two is still an even number — so round your number DOWN to the nearest number that meets those criteria. Recently, I had several projects coming off the needles at nearly the same time. Here they are in all their glory. Click any of the pictures to embiggen. 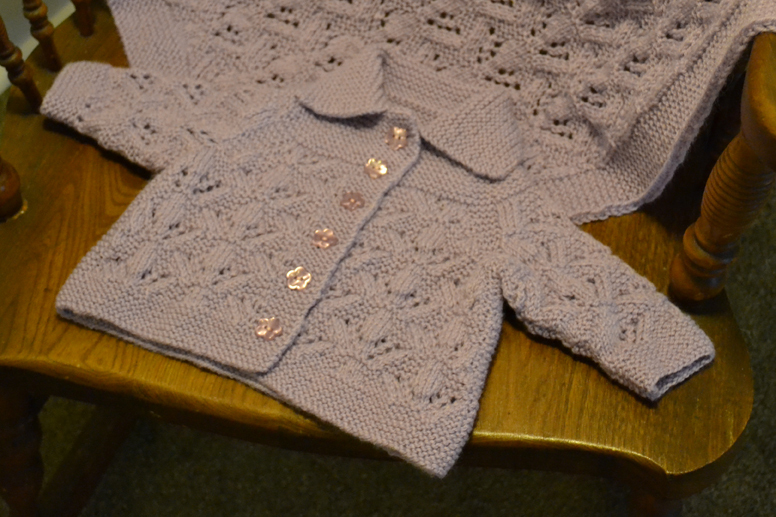 Up first, a baby sweater, made for my friend Cheryl’s new (and first) baby granddaughter. Once I found out her daughter was expecting a little girl, I seized the opportunity to make something girly (since there are no wee baby girls among my closest friends and family at this point), especially since Kim was having a clearance sale on this nice cotton yarn at the time. 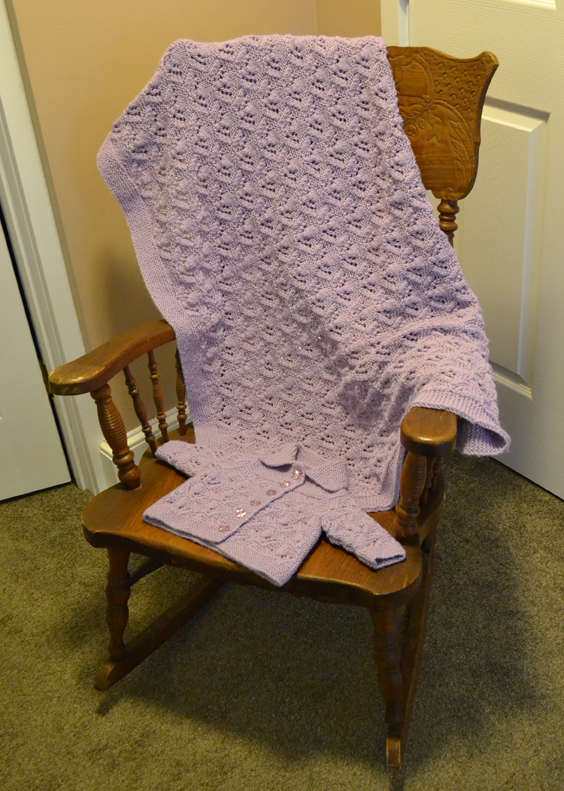 For those on Ravelry, here’s my project page. Since I had some yarn leftover (and I still do! ), I made a hat to go with the sweater. I’ve had my eye on this pattern for a while and I’ll definitely be using it again for some charity hats for the Reading Hospital nursery. The top of the hat is the cutest part. But the i-cord bindoff that gives oomph to the rolled brim is pretty damn cute, too. The hat is worked from the top down, and it’s a really easy pattern to knit — looks way more complicated than it is. Just yarnovers to make the eyelets and decreases to make the star points and swirls. And, finally, a pair of socks! Yes, it feels like forever since I last completed a pair of adult-sized socks! These took me the longest to make so far. Not because the pattern was difficult (it wasn’t), but because I also worked on 16 — yes, SIXTEEN — other knitting projects over the same period of time. So these spent a lot of time in the knitting bag, waiting to be picked up during a free moment. I present to you my Fearless Monkeys. 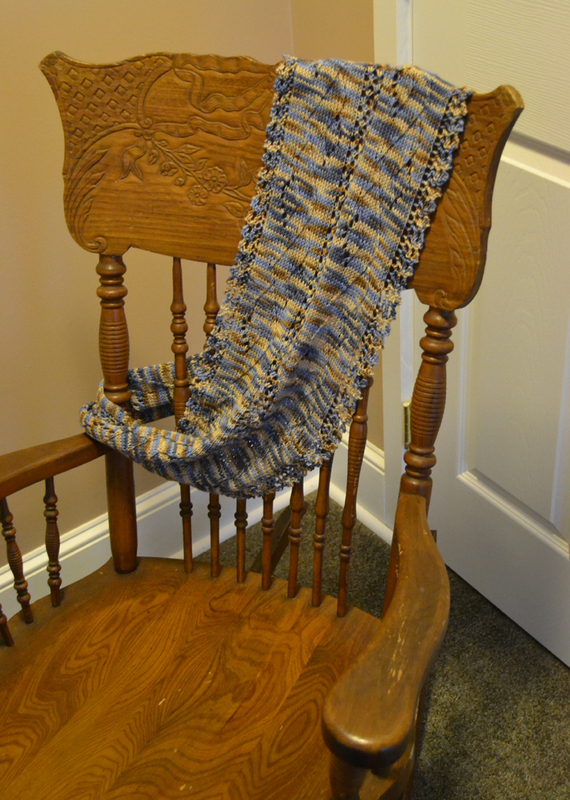 I so loved working with this yarn. Sooooo soft, like petting a kitten (without the claws prickling your skin). They are my “Fearless Monkeys” because the pattern is called “Monkey”, and the yarn is by Fearless Fibers. Plus, I fearlessly knitted them two-at-a-time on one circular needle (not the first time I’ve done that, but the first time I did that cuff-down instead of toe-up). Seriously, the yarn is gorgeous. I had been working on the socks in not-such-great lighting in my living room most of the time, but one day when I took them into work and knitted over my lunch break at my desk, with all sorts of sunlight streaming in the huge windows, I could see all kinds of shades of brown, tan, olive, and even a pink the color of a kitten’s nose all blended in the yarn. Absolutely beautiful. Currently, I only have two projects on the needles. First, a pair of socks (for me, of course) that I’m knitting cuff-down and one at a time — a drastic departure from what seems to be my preferred method of toe-up, two at a time — and second, a classic, v-neck sweater (yeah, also for me), which thus far seems to not be turning into a disaster like the first one I made for myself something like 9 years ago. More to come on those two projects, once they’re finished.